Having a robust fire safety program is an important part of maintaining the health and safety of your employees. When it comes to dealing with small fires,Fire Blanketsare an ideal solution, and we offer a selection of sizes and materials. While you should not useFire Blanketswhen a large fire breaks out, they can be critical in preventing the spread of small fires, especially those fires caused by fat, oil or grease in cooking areas, such as a kitchen or a canteen. Given their function,Fire Blanketsare also a useful fire safety feature for the home. Afire blanketis a safety device designed to extinguish incipient (starting)fires. It consists of a sheet of afire retardant materialwhich is placed over a fire in order to smother it. 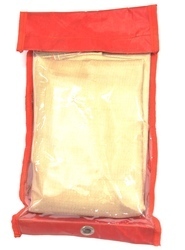 Small fire blankets, such as for use in kitchens and around the home,are usually made offiberglassand sometimes kevlar, and are folded into a quick-release contraption for ease of storage. Fire blankets, along with fire extinguishers, are fire safety items that can be useful in case of a fire. These nonflammable blankets are helpful in temperatures up to 900 degrees and are useful in smothering fires by not allowing any oxygen to the fire. Due to its simplicity, a fire blanket may be more helpful for someone who is inexperienced with fire extinguishers. Larger fire blankets, for use inlaboratoryand industrial situations, are often made ofwool(sometimes treated with a flame retardant fluid). These blankets are usually mounted in vertical quick-release container so that they can be easily pulled out and wrapped round a person whose clothes are on fire. 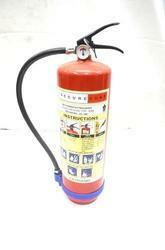 We are offering Fire Ball Fire Extinguisher to our clients. 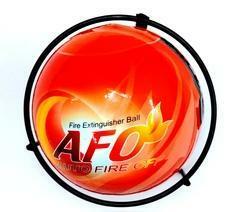 Fire Extinguisher Ball is ball type, light weight only 1.3kg. Just need fix it in somewhere may get fire, once the fire touch ball, it would be explode very fast and effectively within 3-5 seconds, extinguishing A,B,C class fire Automaticallyto protect life and property in advance and work well to prevent the similar disaster. Sure, you can also throw/roll the fireballs into fire to extinguishing fire. • A hood with visor and inbuilt Firemen's helmet. • A pair of five-finger glove. We bring forth for our clients superior quality Dry Powder Fire Extinguishers that are corrosion resistant, durable and compact in size. Their suitability for B & C class of fire like petrol, oil, paints, thinner, spirits, flammable gases & electrical fires makes this ideal for various industry usage. Our range can be availed at reasonable industry prices as per the requirements of the customers. Suitable for B & C class of fire involving Petrol, Oil, Paints, Thinner, Spirits, Flammable Gases & Electrical fires etc. Note : Waratnty is for 3 years from the date of bill for powder based. We have emerged as one of the leading and highly recognized manufacturers of a broad collection of Dry Chemical Powder Type Fire Extinguisher ( पाउडर वाला अग्निशमन यंत्र डीसीपी 6किलोग्राम). 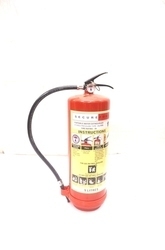 We are one of the leading suppliers and traders of highly superior Dry Powder Fire Extinguisher. They are made using high-quality components and are acclaimed for their reliability. They are available to clients in upright as well as trolley-type varieties in various capacities. They are used widely in residential and commercial spaces for fighting fire caused by flammable liquids, chemicals, electronics etc. They are user-friendly and successfully put out fire of differing magnitudes.We procure the raw inputs and components sued in their developments from well known and highly certified vendors of the industry to maintain their top quality. Additionally we have hired a team of quality inspectors who check these products rigorously before final delivery. 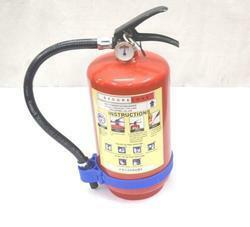 Our company has achieved widespread recognition for providing Portable Water Fire Extinguisher to the clients. Offered product is precisely developed and reasonable in rate. We are a highly acclaimed firm involved in offering the best quality Portable Fire Extinguisher Water Type (stored Pressure) at the most reasonable prices. These extinguishers are manufactured in stringent compliance with industrial quality standards at our ultramodern infrastructure facility. These extinguishers are easy to use, light-weight and portable. These are used to put out fire of different categories. These extinguishers are economically priced and pose no risks. These are completely safe to use. A fire blanket is a safety device designed to extinguish incipient (starting) fires. It consists of a sheet of a fire retardant material which is placed over a fire in order to smother it. Small fire blankets, such as for use in kitchens and around the home, are usually made of fiberglass and sometimes kevlar, and are folded into a quick-release contraption for ease of storage. Our product Fire Blanket was developed keeping in mind the safety of people working in manufacturing plants and indoor or outdoor work sites.